Were you looking for the book with access to MyAccountingLab? This product is the book alone and does NOT come with access to MyAccountingLab. Buy Management and Cost Accounting, 6th edition with MyAccountingLab access card (ISBN 9781292063553) if you need access to MyAccountingLab as well, and save money on this resource. You will also need a course ID from your instructor to access MyAccountingLab. This popular text offers clear and comprehensive coverage of management and cost accounting for students and professionals. 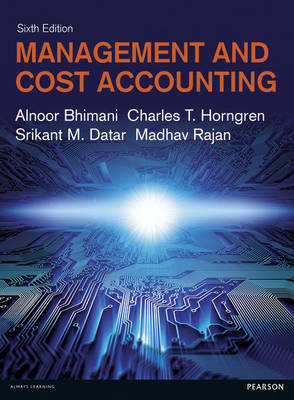 Management and Cost Accounting is the European adaptation of Horngren, Datar and Rajan's leading US text, Cost Accounting: A Managerial Emphasis. The content has been significantly revised to reflect management accounting syllabuses across Europe. Rich in examples and real-life applications, Management and Cost Accounting brings technical and theoretical concepts to life. The international focus of the text is supported by a wealth of case studies featuring companies from around the world, and all coverage is fully updated in line with recent research.